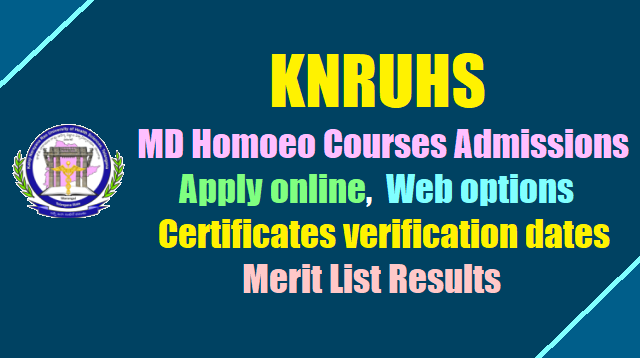 KNRUHS Ayush PG admissions, PG Ayush courses Admissions - KNRUHS MD Unani Courses admissions 2018 Final Merit list Results/ KNRUHS MD (Homoeo) courses Admissions 2018, Apply online/ KNRUHS MD (Homoeo) courses (Entrance test) 2018, KNRUHS MD (Homoeo) courses admissions 2018, Online application form, Last date for apply online, Selection list Merit list Results, Web options, Certificates verification counselling dates and more details time to time available @ Website http://knruhs.in. Kaloji Narayana Rao University of Health Sciences Telangana State has given notification for Admissions into M.D. (Homoeo) courses available in Telangana under KNRUHS for the academic year 2018-18. Application forms through online are hereby invited from the eligible candidates for admission into M.D. (Ayurveda) courses for the academic year 2018-19 in Colleges located in Telangana State affiliated to Kaloji Narayana Rao University of Health Sciences, Warangal. NOTIFICATION FOR ON-LINE APPLICATIONS FOR ADMISSION INTO MD HOMEO COURSE FOR THE ACADEMIC YEAR 2018-19 UNDER KNR UHS. Applications on-line are invited from candidates who have appeared for AIAPGET-2018 ( Homeo ) , whose names figure in merit list and who full-fill the eligibility for admission into MD Homeo Course for the academic year 2018-18 in JSPS Govt. Homeo Medical College, Hyderabad affiliated to KNR UHS. The print-out of application along with 2 sets of self attested copies should be submitted at the time of certificate verification and counseling as per schedule notified by KNR UHS. Those who have passed the Degree Examination after undergoing a course of study in Homoeopathy of not less than 5 ½ years duration including the period of compulsory internship; or Those who passed equivalent Degree Examination included in the 2nd schedule of Homoeopathy Central Council Act 1973. Candidates who are already admitted and studying M.D. (Homeo) course shall not be permitted for counseling, until they discontinue the course before submitting the application form and such candidate shall submit the discontinuation certificate issued by the Head of the Institution along with the application. Candidates who are already holding a Post Graduate Degree in Homoeopathy in a subject shall not be eligible for admission into another P.G. Homeo Course. Merit Position of the candidates who have applied on-line shall be determined based on AIAPGET-2018 (Homeo) rank and percentile as per their eligibility. candidate born earlier will be considered as first in merit rank. a) . AIAPGET-2018 ( Homeo ) Hall Ticket. b) . AIAPGET-2018 ( Homeo ) Rank Card. (c) Date of Birth Certificate. (g) All marks memos from 1st B.H.M.S. to final B.H.M.S.. (h) Scanned Photo (80 kb in size). 1) Applications on-line are to determine the provisional state merit position. the time of certificate verification and counseling. Homeopathy will be applicable for admissions. +note that the University will take up the verification of original certificate with regard to eligibility conditions. i.e. educational qualification, validity of registration with State Council concerned internship, local/non local area status after duly verifying all the relevant certificates in original at the time of verification of original certificates / counseling . If the information furnished by him/her in the application is incorrect, his / her candidature is liable to be cancelled and further action that deems fit will be taken. AIAPGET-2018 Homeo and KNRUHS, Merit list.